DON CORNELIUS R.I.P. ROCK IN PERPETUITY! 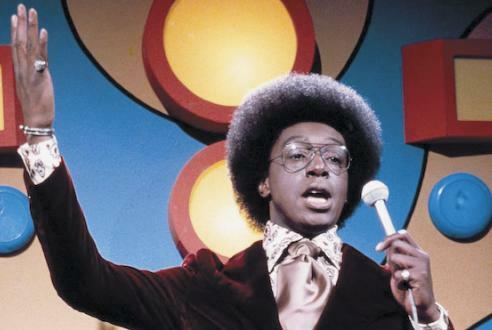 Don Cornelius stayed on the scene for so long, because he didn’t try to act cool…he was cool! In the US, he was always surrounded by fans, singers, producers, all vying for his attention. In Europe, however, it was a different story, SOUL TRAIN wasn’t being broadcast yet, and nobody knew who he was. I was attending MIDEM the annual gathering of music business people held in Cannes, and I saw Don standing alone at the Martinez Hotel, staring impatiently at his watch. I never met him before, but I thought this would be the perfect opportunity. I buffed the toes of my platform shoes on the back of my pants leg., cocked my “Superfly” hat, walked over and introduced myself. He smiled in a guarded kind of way. I told him I represented the publishing of many artists he had on his show including Sly Stone, Billy Preston, and Donny Hathaway. He warmed up a bit, and then we talked about music until his late friends showed up and whisked him off to parts unknown. I did, and every Saturday morning on my TV, I learned a new step from the SOUL TRAIN GANG or see a new artist like Al Greene, or Mary J. Blige perform. Thank you Don Cornelius, for all you’ve given us. MAY YOU R.I.P. ROCK IN PERPETUITY!